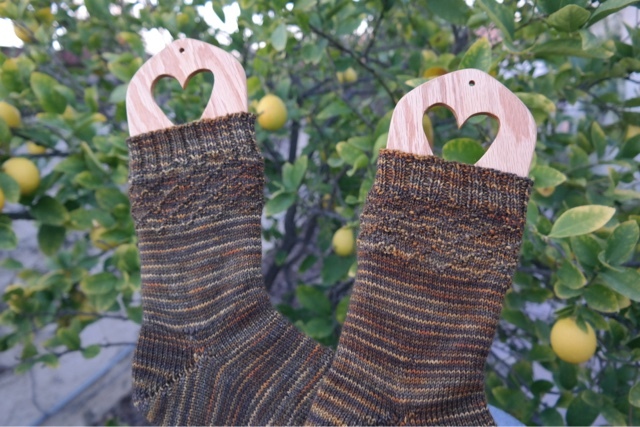 random thoughts...do or "di": Do Socks Grow on Trees? My latest pair of socks was made for my friend, Karen, who lives in Michigan. 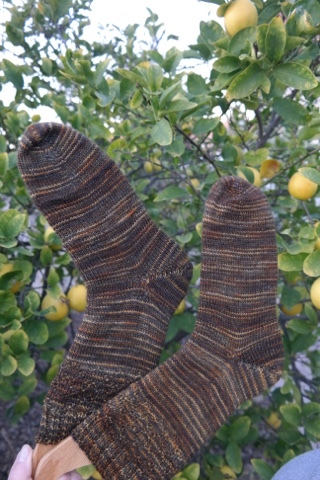 They needed to be photographed with the lemon and lime trees as their backdrop; not only because the socks look good with the trees as the backdrop, but because our citrus trees are bursting with fruit right now, and that might make a mid-westerner a bit envious. This way I got to feature the fruit and the socks. These trees are some of the things I love most about our garden. I don't know when the last time was that I purchased a lemon or a lime. I have a continuous supply all year long. Now back to the socks. I promised my friend a few months ago that I would make her a pair and finally got around to getting them shipped off. They've been done for a while. 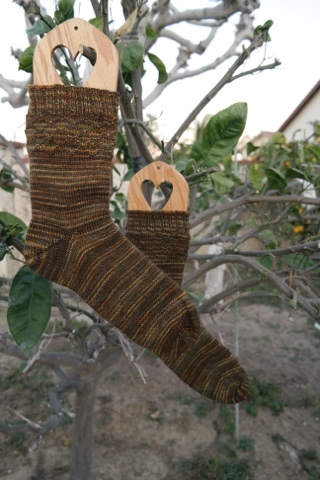 The pattern is my usual simple sock pattern with a Fish Lips Kiss heel. 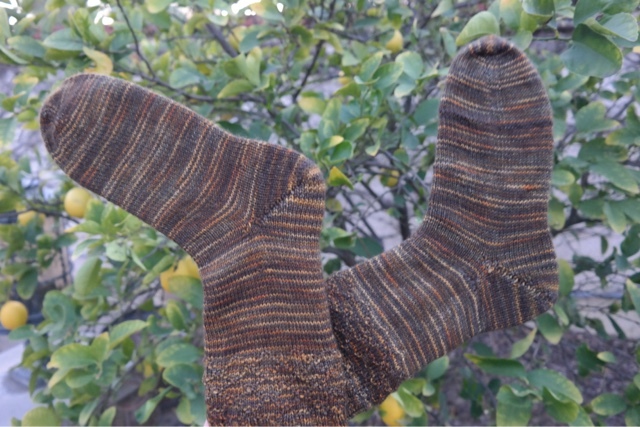 I added the cuff details, using the same stitch pattern that I did with my Color Block Socks. 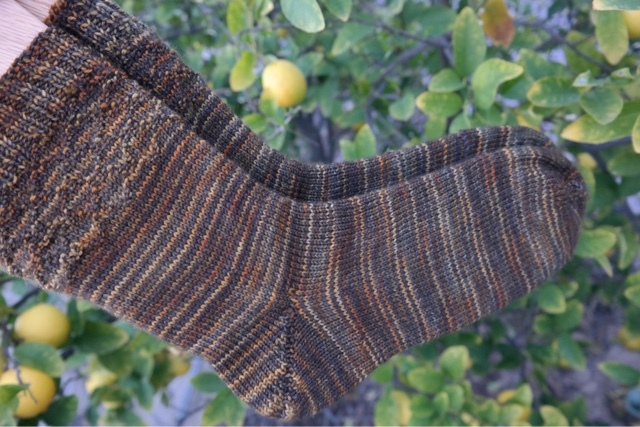 The color of these socks is really pretty but I still have a hard time when each sock looks like it was made from a different dye lot. I am assured by the dyer that these are natural occurrences in hand dyeing, but it still bugs me just a bit. The colors are really pretty the way they change from browns to gold, so I really can't complain too much. These socks are knit toe up. 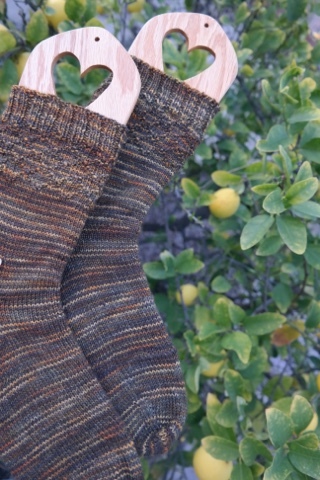 My friend, Trina, told me that she uses a really short circular needle and knits her toe up socks in the round, after first starting them on double point needles or with the Magic Loop method. Then she uses a stitch marker to know when a new round starts. But I found the short, 12" circular a little bit fiddly for my arthritic hands and wrists. So I kept switching from DPN's to my 24" circular, until I finally decided to stick with the 24" circular. 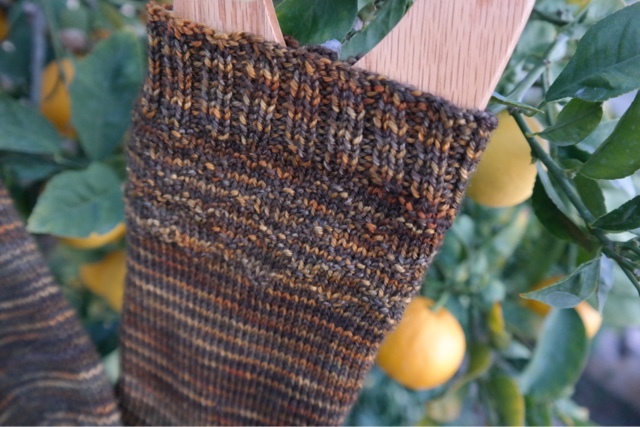 This pair of socks wins for most needle switching. 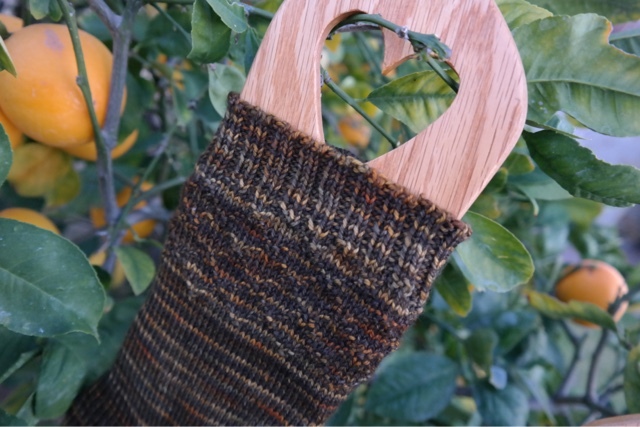 Yarn:Super Sweet Sock Yarn by Sweet Fiber. I'm jealous of your citrus trees and I live in Dallas, Texas. Generally our winters are too cold but not this year. The socks are great! Your socks are fabulous! Thanks for the inspiration to cast on a new pair. I love my socks that you made me Di!